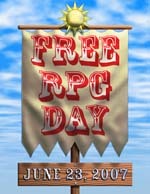 Happy Free RPG Day from all of us at Green Ronin Publishing! Until 12am Sunday morning, you can download the Mutants & Masterminds Beginner’s Guide, True20 Adventure Roleplaying, and Bleeding Edge Adventures #5: Temple of the Death Goddess, for free from our Green Ronin Online Store. To make all that free shopping even easier on your mouse hand, we’ve created a Free RPG Day category, including all three free products. This also seems like a good time to mention that the Temple of the Death Goddess PDF zip file includes a free PDF of Initiative Cards for the adventure, custom-made by The Game Mechanics. The Initiative Cards PDF will also be put on our site as a free download, so that those who purchase the print version of Temple of the Death Goddess can also access these Initiative Cards. //greenronin.com/wp-content/uploads/2017/07/RoninBanner-1.png 0 0 Evan Sass //greenronin.com/wp-content/uploads/2017/07/RoninBanner-1.png Evan Sass2007-06-23 00:06:412007-06-23 00:06:41Happy Free RPG Day! Free RPG Day Promotion Let’s Make That Free RPG Week!